Context, organizer of critically acclaimed walking tours, expands its program in Budapest with Barons of Budapest, a new history and architecture tour that offers travelers exclusive access to the city’s Palace District, including homes and palaces not ordinarily open to the public. The story starts in 1867, the year Budapest was crowned the twin capital of the Austro-Hungarian Empire and saw an influx of politicians, aristocrats, and entrepreneurs eager to develop the city. In an attempt to compete with Vienna and Paris, the great noble families of Budapest set about constructing palaces of Baroque opulence and splendor. Led by art historians and cultural experts, Context’s walk equips travelers with an understanding of the singular set of social and economic circumstances that made this boom possible, and explores a wealth of architectural masterpieces. The experience takes in Pest’s 8th district, including the area behind the Hungarian National Museum. The scholars and experts who will be leading the walk—including professors from local universities and historians attached to local research institutions—investigate how the area, known as Józsefváros, evolved from an outlying agricultural zone to the epicenter of Budapest’s economic, political, and cultural blossoming. Detailed stucco work, carved woodwork, and rich interior furnishings provide the lavish setting for an exploration of themes of politics, upper class daily life and leisure activities, taking visitors inside the homes of Hungary’s 19th century aristocrats. Barons of Budapest lasts two and a half hours and is available Monday to Friday. Group walks cost Ft9,900 per person. Private tours cost Ft47,000 per party. As with all Context walking seminars, groups are led by a credentialed expert and limited to six (6) people maximum. Founded by National Geographic writer Paul Bennett and designer Lani Bevacqua, Context Travel is a network of English-speaking scholars and professionals, including art historians, writers, architects and gastronomes, who organize and lead walking seminars in twenty-three (23) world cities, including: Florence, Rome, Venice, Naples, Paris, London, Edinburgh, Madrid, Barcelona, Berlin, New York, Philadelphia, Boston, Washington, D.C., Istanbul, Athens, Beijing, Shanghai, Vienna, Prague, Budapest, Tokyo, and Kyoto. A certified B Corporation, Context Travel was named one of the fastest growing American companies in 2011 by Inc Magazine. Travel + Leisure has called Context one of the top European tour companies for its innovative approach to travel and the depth of its programs. To learn more about Context, visit the website at: www.contexttravel.com. 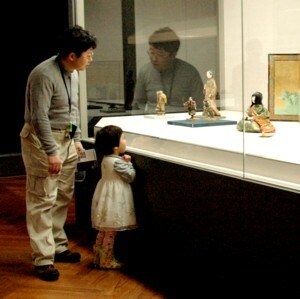 A girl with her father admires one of the dolls on view at the Tokyo National Museum. Context has a new walking tour of Tokyo that features the Tokyo National Museum © 2013 Karen Rubin/news-photos-features.com. Context, a critically acclaimed walking tour company whose small-group, scholar-led “walking seminars” have revolutionized day tours in cities across Europe and North America, is continuing its expansion into Asia with the opening of tours in Tokyo and Kyoto. Working with local historians, Context has opened with five innovative tours in each city, designed to help curious visitors understand and appreciate Japanese history and culture. Offerings in Kyoto include a thematic walk on Japanese garden and landscape design that visits the Golden Pavilion, as well as a tour on Shinto and Buddhism in the historic Gion neighborhood. Context also offers a woodblock printing workshop with a well-regarded master of the craft as part of its ongoing “experiential tours” program in all cities where it operates. Context’s Kyoto experts include historians of 19th century Japan, architects, and culinary writers. Context’s Tokyo program includes a tour of anime, manga, and other forms of pop culture, focused on the Akihabara neighborhood, an epicenter of such otaku culture. The organization is also offering a walk on Japanese aesthetics in the Omotesando and Harajuku areas, as well as a visit to the Tokyo National Museum, and a three-hour Welcome to Tokyo program in which a local expert meets travelers at their hotel and assists them with the basic logistics of visiting this large, complex city. In both Tokyo and Kyoto Context offers walks privately on request and as regularly scheduled shared group walks. Private walks start at ¥32560 for the party, while group walks start at ¥7040 per person.